The Saga of the Skolian Empire is Catherine Asaro's trademark series. It chronicles the lives of the members of the ruling family of the Empire in the distant interstellar future, weaving a fine blend of action, romance, and hard science fiction. 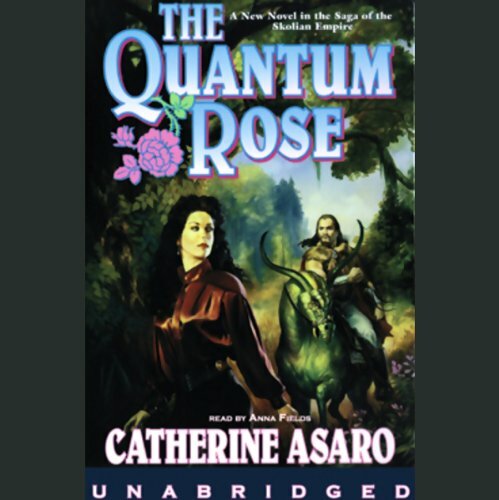 The Quantum Rose is the story of Kamoj Argali, the young ruler of an impoverished province on a backward planet. To keep her people from starving, she has agreed to marry Jax Ironbridge, ruler of the prosperous neighboring province. But before they can be wed, Kamoj is forced into marriage with a mysterious stranger from a distant planet, throwing her world into utter chaos. Don't miss any of the books in Catherine Asaro's Saga of the Skolian Empire. I was hoping this would be better than "Catch the Lightening" and more like "Primary Inversion", her first 2 books of the series...but it sort of fell in the middle for me. The plot was hard to grasp, because the main focus of the book was the romance. The one thing I really like about Asaro's writing is her beautiful descriptions of other worlds with their multiple moons, stained-glass forests, exotic creatures...and that's the only reason I will keep reading her, because the plots and the characters just don't have a lot of depth. The story is pretty much like a soap opera. There are the steamy scenes with the a young woman and an older man. There is treachery, betrayal, and conflict. Its a quick book and the performance is very good. The book name and the name of all the characters is pretty interesting once you figure it out. I was somewhat disappointed that this was a Nebula award winner, but it was a quick read and kept my attention. It's an OK read if you like Skolia already (and like it a lot). But it wasn't for me. The only time I found any excitement or tension was when the heroine was kidnapped, but that didn't last long. Other than that, people were way too happy and friendly with each other to make an interesting read. I sure don't see a reason for a Nebula award, but no story is beloved by all people. Blah ending for me. You could predict it easily. I was ready for the story to end long before it did. Nice portrayal of a resident population fighting invaders, but not realistic. She had something like a couple hundred thousand people in a tent city on the plain. They would have used up all food and water resources within miles and miles in just a couple days, not to mention lack of sanitary facilities. In Fantasy, you needn't be realistic, but Science Fiction usually tries to act like it could happen. Would you be willing to try another one of Anna Fields’s performances? No, Ms. Fields narration bothered me more than the story. She makes the hero sound like he's a drunk teenager. She does not excel at male voices. Maybe if Spielberg and Lucas did a great makeover. Ms. Fields narration ruined this for me, but the story wasn't that enthralling. After reading Primary Inversion, I was ready for a supposedly award winning novel in the series. I didn't feel like I received that experience. This is the first Skolian Empire book I've read. It's good, and I like it. It's a good companion for the mindless labor I have to do for the next few days, It's well-written and competently plotted ,and the romance is fun. However. I'm on chapter 5 and so far there've been one scientific inaccuracy and two evolutionary impossibilities that should have been edited out. The people on the planet have either to be a result of parallel evolution or descendants of human space travelers, with human DNA. [I suspect the latter--how else could they interbreed?] Asaro gave them physical characteristics that preclude either possibility. The hero's response to oxygen deprivation was spot on; so she really should have looked up how the human brain reacts to an oxygen-rich environment. The Audible bio says Asaro is a physicist who belongs to a seriously talent-rich writers' group. I expect she knows something of evolution and biology---you can't get a BS in any science or technical field without taking physics, chemistry and biology along with the math, even if you love one subject and would rather be beat with a stick than take the other two. I suspect that a writer with her educational credentials knows her stuff. I'm wondering if she and her readers decided that these discrepancies were too trivial to matter and were less important than the development of the fictive world. Logic counts. The little things matter. And just you get one thing wrong, no matter how arcane, and somebody will always write you to tell you about it. AND I LIKE THIS BOOK. I'D RECOMMEND IT TO ANYBODY! "Since a boy he only wanted to be farmer..." What a HORRIBLE way to end a supposed science fiction book!! A few fantasy factoids. . .they have 8 fingers because of their binary world. No science to this book. .I did keep hoping. Much, much more romance than fantasy or SCIENCE FICTION(???) I WAS SO DISAPPOINTED.